Microsoft is looking to recoup its share of the cake in the web browser market. To do this, the Redmond firm changed its mind and decided to make its Edge navigator accessible to everyone. The browser is now compatible with all OSes. However, the biggest change is in the software architecture. Edge is now based on Chromium, the open source project used for Google Chrome. The browser therefore supports many more extensions than before. 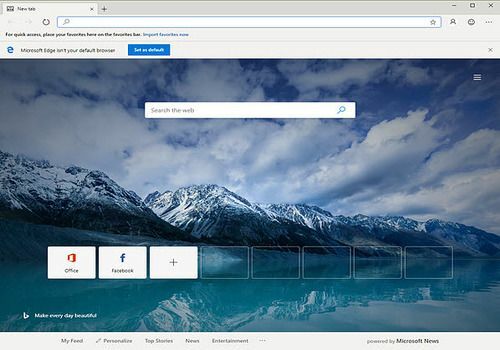 Microsoft Edge Chromium is fully customizable and has a very user-friendly and intuitive interface. There is no need to say, Microsoft is doing everything in its power to better compete with Google and Mozilla. Mozilla Firefox is the reference browser. Completely secure, it allows you to surf the Web in complete serenity. Firefox is also customizable at will thanks to its many plugins that can be downloaded for free on the publisher's website. The fastest and most efficient web browser with one update every 6 weeks. Tor Browser is a web browser dedicated to those who want to go on the Internet without anyone being able to monitor which sites you are going to. This will give you better protection of your privacy. Avast Secure Browser is a program developed by Avast. It is a web browser that offers many options dedicated to the security and confidentiality of user data. A browser that comes to us from Vietnam and that offers in addition to the features specific to web browsing, a whole series of tools to facilitate downloading and take advantage of websites. This browser has the advantage of being free of commercial links.